Hello everyone! Hopefully by now my fellow SMC students are done with finals and safe at home. I arrived home yesterday and couldn't be more excited to have an entire month off to spend with friends and family, free of schoolwork! But of course I will be excited to return to SMC and start my new classes next month! I feel like finals week can have a bad reputation, but I'm here to tell you that while it can be stressful at times, it is definitely manageable if you plan/spend your time wisely. This semester, I had one final/day. Fortunately, two of them weren't cumulative, which definitely helped with the amount I had to study! 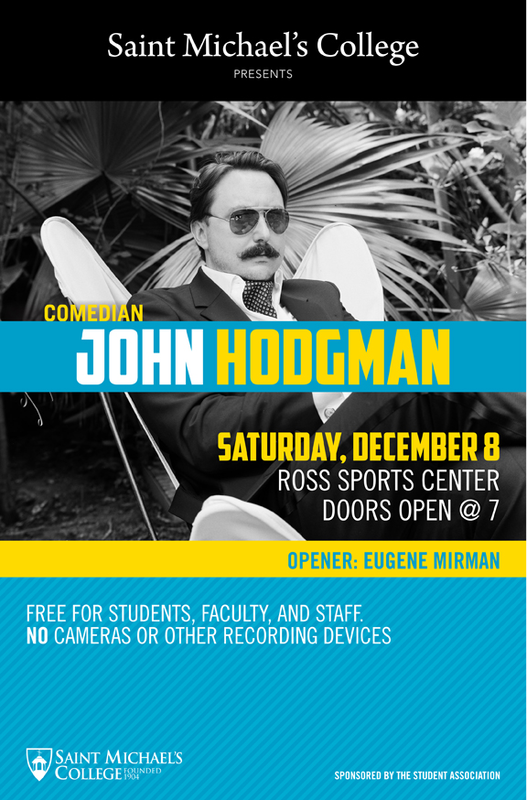 But before my tests started, SMC had comedian John Hodgman (the PC guy from the Mac commericals) come and perform for students to relieve some of the pre-finals stress. 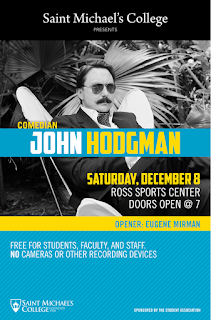 He was hilarious, as was his opener, Eugene Mirman. I think he provided everyone there with some much needed laughter! Sunday was when my intense studying began. My first test was for Anthropology on Monday. It was only on material we'd covered since our midterm, so that definitely lessened the material I had to study. I was surprised and impressed with how much we were able to cover in just half a semester! I spent Sunday studying, and then going to the last 7pm Mass of the semester. I will definitely miss my faith community at SMC over the next month! I'm especially excited to return because our annual Liturgical Ensemble trip is coming up at the end of January/beginning of February! Just one of the many little things that makes SMC such a special place! Once I was done with chemistry for the day, I moved on to Research Methods. The in-class part of our final mainly focused on intensely analyzing a study on EMD - Eye Movement Densensitization. In the midst of studying for that, the fire alarm went off in Linnehan because somebody burned some popcorn - oops! I didn't midn though because right as everyone was filing out of the building, the shuttle pulled up, so many of the girls who live on my floor got on and took a ride with Dragon, the driver, to main campus and back. Once we got back to North Campus, everything was fine and we were allowed back in the building. It was definitely a fire alarm I'll never forget! Tuesday morning was my Research Methods final, which I think went well! After that test, I started working on the take-home portion of my final, which involved testing some data we were given and figuring out whether the results were significant or not. Once I finished that, I moved on to more studying for chemistry, specifically reviewing the material that I didn't know from the quizzes and exams I took on Monday. On Wednesday morning I took my chemistry final. I was surprised at how much I knew and I'm excited to see what my final grade will be! After that, it was time to study for my Social Psych exam. Studying was going well, so I decided to take a break and go into Burlington with my friend Cait, who was bringing out friend Sharon to the Burlington Free Press for an internship interview. While Sharon was in her interview, Cait and I went to Starbucks and Phoenix Books, right off of Church Street. I had never been to Phoenix before - it was adorable! After Sharon finished her interview, we went to My Little Cupcake to celebrate. Then it was time to head back home so I could continue studying and pack to go home! Yesterday morning I did some last minute studying while getting ready and eating breakfast, then took my exam. Social Psych was my favorite class this semester, so I was glad to end on a high note! Once my exam was over, I headed back to North Campus to do some last minute packing, then headed home to New Hampshire. I've been home for about 24 hours and I'm loving every second! I'm especially excited for my best friend Paige to come home this weekend - I haven't seen her all semester! SMC kids - congratulations on being done with finals and enjoy your well-deserved break! Sending good luck to those who sent in their Early Action I applications - so excited for you to hear from SMC very soon! Also, thinking of those affected by the events at Sandy Hook Elementary this morning. My thoughts and prayers are with you! Hope everyone has a great weekend and thanks for reading my blog!